Within a week of Sam’s early arrival, Dave and I had purchased 2 books on prematurity and borrowed another 2 from the NICU library. We wanted to know what was coming, both during Sam’s hospital stay and afterwards. We learned about all kinds of scary complications and risks. We had a lot to worry about. Now most of those worries are a distant memory, but a few still remain. Some will be around for a long time. 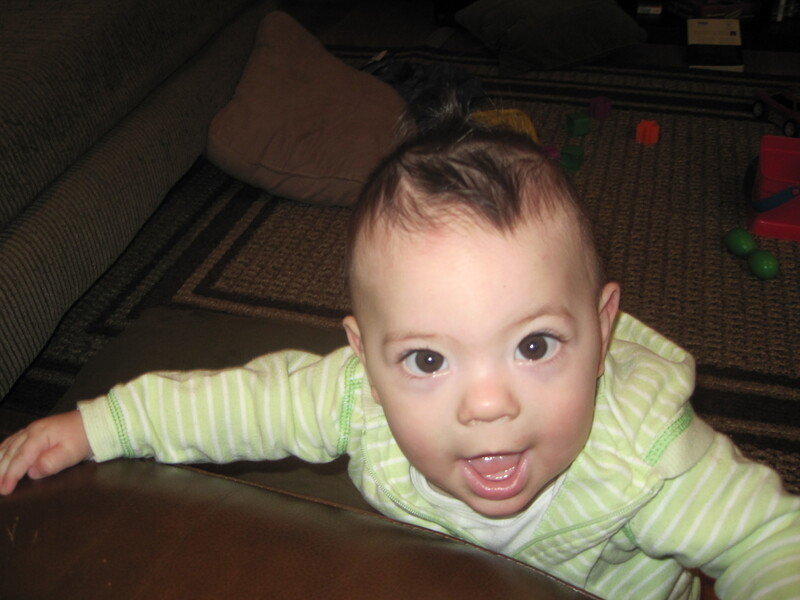 About 45% of babies born as early as Sam develop learning disabilities, for example. What kind of learning disabilities, you ask? Problems with math, according to Sam’s neonatologist. Also some reading difficulties. So even though Sam is doing amazingly well, we’re always watching and waiting for some problem to come up. Lately, we’ve been worrying about 2 issues. One is feeding. Many preemies have feeding issues and can develop an aversion to eating. I know this, so I worry a lot when Sam cries as we put him into his high chair and then joylessly takes a few bites of carrots. Green beans I can understand, but carrots?! As it turns out, Sam is not a fan of my homemade baby food but will scarf down a full jar of Earth’s Best and ask for more. Problem solved! The other issue is babbling. Sam makes a lot of noise, but up until today hasn’t been repeating any consonant-vowel pairs. We were even thinking about making an appointment with a speech therapist to work on it. However, today a flip was switched somewhere in his brain and he’s saying ma-ma-ma, ba-ba-ba, and wa-wa-wa. We’re delighted and relieved to hear this! We’ll post a video as soon as we get one! yep, I totally get it….